Say this for David Pearce’s novel The Damned Utd – it was the first really unembarrassed cultural treatment that the national game has ever had. Fever Pitch broke the ground. But Fever Pitch was gauche, blushing, unsure of its reception. It was essentially uncontroversial, and that is what has set The Damned Utd apart: the real hurt and confusion the novel caused, the bad memories it revived, the losses it refreshed. It may have helped cement Brian Clough in his full and proper place in the public life of the country, but The Damned Utd exhumed Don Revie and Revie’s Leeds along the way, and didn’t do the same for them at all. Much of the drive for Richard Sutcliffe’s new biography of Don Revie comes from anger at The Damned Utd, and because the issues that the novel raised about Revie are the narrowly footballing ones, it’s these that Sutcliffe concerns himself with. Why isn’t Revie seen in the same kind of light as Busby, Shankly, or Clough? Do Leeds deserve to be remembered only for cynicism and winning at all costs? What’s the real story about Don Readies: the manager and his money? 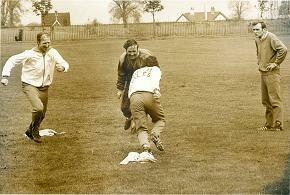 What really happened to Revie at England? There is a wider significance to the life and work of Don Revie, which Sutcliffe leaves aside. The way Revie stands for Leeds, for instance, as the Chamberlains do for Birmingham. The sheer depth and breadth of change in the life of a man born in poverty in Middlesbrough, whose son went to Repton and Cambridge, who ended his career wealthy and honoured in the Middle East where his home is now a beloved shrine. The issue of what happened to leaders with backgrounds like Don, who before the 1973 Oil Crisis seemed set fair to rule Britain and take her into a better future. What does it mean, too, that Don Revie was so young when he retired? He had just turned fifty when he resigned from the England job. More than half of all current Premiership managers are older, including Tony Pulis and Steve Bruce. It hardly seems possible, but Revie was largely photographed in black and white, which, unless you are a Beatle, makes you look older than you are. All that had to be left aside. Football matches make football biographies different from those of politicians, artists and writers, because games turn careers and there are so many of them. There has to be at least one book that does the heavy digging of tracing an important career through, game by game, club by club, transfer by transfer. What we really lacked was a proper, basic, detailed reference biography of Don Revie, and this is what Sutcliffe has provided. Sutcliffe wants to make the case that Revie’s achievements were equal to those of his rivals and contemporaries. Contemporaries they were, too: Shankly and Nicholson both retired in the year Revie left Leeds, Busby wasn’t long gone, and Clough was about to take himself out for three seasons. In terms of sheer club achievement, there’s no doubt that Revie is at home with the very best. He was only at Leeds for thirteen years, and when he began, Leeds was a cricket and rugby league city. United were considered beneath not just Yorkshire Cricket Club and Leeds (Rugby League) but Hunslet and Bramley RFCs as well. 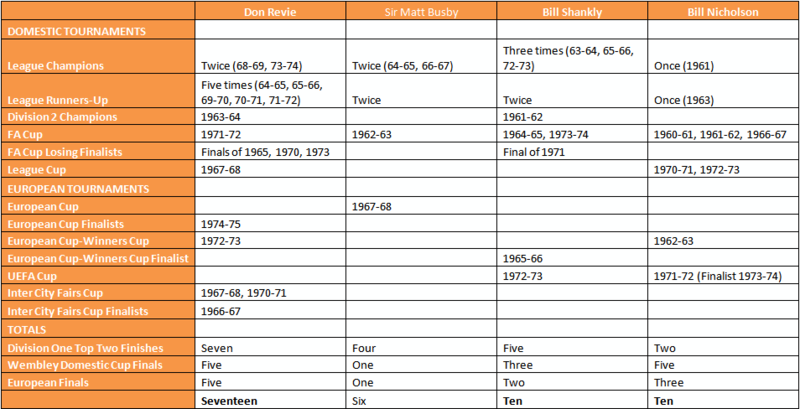 This table compares Revie’s achievements at Leeds with those of Sir Matt Busby, Bill Shankly and Bill Nicholson over the same period. 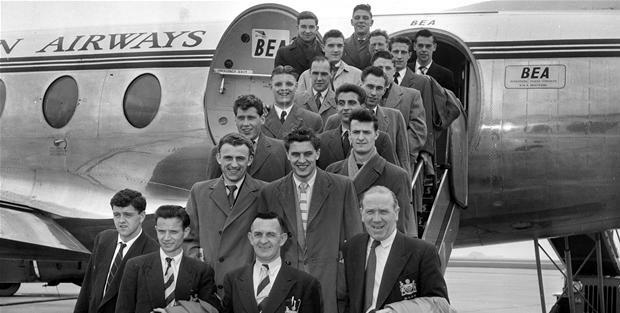 I’ve included the 1975 European Cup Final because although it post-dates Revie, it was Revie’s team in Paris that night, ably shepherded by Jimmy Armfield. No Harry Catterick, Bertie Mee, Brian Clough, Joe Mercer and Malcolm Allison here, but the table highlights just how competitive an arena Revie found himself in. Most observers agree that the period 1956-1973 was the absolute apogee of English club football, in achievement and in absolute depth of talent. Leeds’ total of seventeen significant football achievements is some way ahead of what Manchester United, Liverpool and Tottenham managed in the same time. Yet, before Revie, Leeds had had no top-level honours of any kind. Even Clough’s clubs had won top trophies before his arrival. Revie had had to build his club from scratch. The manner in which Revie succeeded is this biography’s second issue, and Sutcliffe deals with it carefully. Leeds weren’t a cynical team: they were a maturing team learning their trade. Revie was protective as they grew. The “Cantona” signing was that of Bobby Collins, who really was a hard case, but he put heart and belief into the talent around him. Other teams had similar players – Chelsea have Ron Harris, for instance. European opposition spat, hacked, rabbit-punched behind the referee’s back. In his last two years at Leeds, Revie took the shackles off his side, and they played memorable football, the kind that would have flattered Anfield or Old Trafford. But by then, the mind of the public had already been made up. When Revie went to England, he realized that the opposition players he had worried over and warned against in his pre-match dossiers – players he now had at his disposal – were not as good as he’d thought, and that his old team, Leeds, had been much better than he had ever realised. In Sutcliffe’s account, Revie came to regret not letting his team express themselves much earlier in their development. So much more might have been won. His caution had robbed his lads of the medals they’d deserved. Sutcliffe treats Revie’s financial dealings in a similar way. Revie was either innocent or no worse than his feted rivals. Revie met Alan Ball on Saddleworth Moor in 1966 to bribe him, but Matt Busby left a suitcase of cash at the young Peter Lorimer’s house in the hope of buying his signature. Sutcliffe denies outright that Revie was ever involved in match-fixing: everyone wonders why he never sued. Perhaps he didn’t want the hassle..
Match-fixing aside, Revie’s relationship with money really does have to be seen in context. Then, as now, the real control of football and the real money in football lay with the club owners. Wealthy as players are now, they are still nowhere near the level at which they could think about buying a controlling stake in a Premiership club. Revie had come from an impoverished, insecure background. In depressed Middlesbrough, Revie’s family were worse off than most. His father found work hard to come by. His mother died. As a consequence, in adult life he took care to balance job security with income maximization. For instance, as a player, he believed in changing clubs reasonably often, and looked out for signing on fees. But as Sutcliffe makes clear, professional care accompanied great personal generosity. After England had beaten Czechoslovakia at Wembley in Revie’s first competitive start, he told his son something that would prove key not only to his management but that of all of his successors. “We haven’t got the players.” In particular, he meant that there were no English equivalents of Bremner or Giles, his key Leeds lieutenants, but he was right across the board: the post-War supply of talent – nourished by fair rationing of food, playing on car-free streets, coached on proper pitches at new schools, made sensible by hardship – was fast drying up. But Revie had issues of his own in any case. A clever man – his son, as we’ve seen, became a Cambridge graduate given the chance – he had always been a deep football thinker. Not necessarily where you’d think – the “Revie Plan”, Sutcliffe establishes, was Manchester City colleague Johnny Williamson’s idea. But his tactical acumen and attention to detail, his novel training approaches and openness to novelty are well established. With England, however, his brain had too much time on its hands. Revie overthought everything. In the weeks and months between internationals, his natural paranoia, superstition and caution overwhelmed his marvellous instincts for a player, a position, an on-field situation. Nor did the techniques he used so effectively at Leeds translate to England. Sutcliffe thinks that players’ opposition to things like dossiers, carpet bowls and bingo have been exaggerated. But that didn’t mean that the Leeds family atmosphere could be rebuilt in Lancaster Gate, it didn’t mean that players could win Revie’s trust in quite the same way and it didn’t mean that the dossiers didn’t sometimes eat away at players’ confidence. Sutcliffe makes clear that Revie was one of those who were gifted with extraordinary emotional intelligence – a man manager of the highest calibre. In the early 1960s, this had enabled him to pull Leeds together, and keep it together, by dint of the extraordinary work he put in to keep his side happy and the support staff involved. But at Leeds, he’d had everyone around him, all the time: at England, bureaucracy and the sheer lack of player contact proved more than he could compensate for. It’s clear from Sutcliffe’s account that England were unfortunate not to qualify for the 1976 European Championship. An absurd draw against Portugal doomed England when they were by some margin the best team in a limited group. But qualification for Argentina 1978 was another thing altogether. Revie’s selection for the crucial match against Italy in Rome was so unexpected – so panicked and erratic, with players out of position and established performers excluded – that the Italians took it as a bluff at first. Then they took advantage. It hadn’t helped that Revie’s attempts to get political with selection misfired. Sutcliffe sets out an intriguing version of events surrounding the 1975 Wembley match against World Champions West Germany. So convinced was Revie that England would be beaten handily, the story goes, that he picked the players he’d been urged by the press to pick, intending them to fail. Mavericks and playboys: Alan Hudson in particular believed that his call-up was to make sure that he’d play himself out of England contention for good. In the event, the “new” defence of Gillard and Whitworth proved solid, Hudson ran riot, and England humiliated West Germany for ninety glorious minutes. Anyone not aware of what had prompted the selection of this particular team might consider that Revie had found a team to win a World Cup. Revie’s disintegration was accelerated by FA machinations. 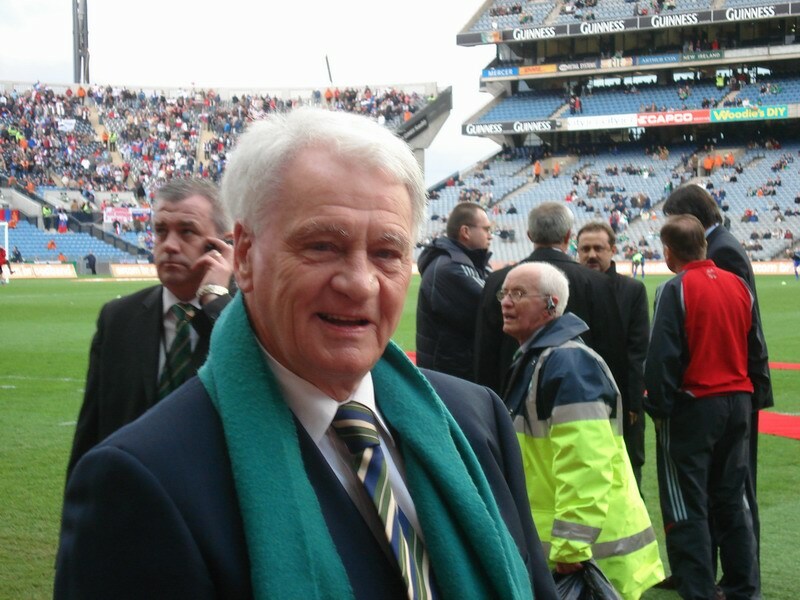 Sir Harold Thompson, an enemy to Ramsey and to Brian Clough in turn, was at the heart of Revie’s troubles. It wasn’t just the secret negotiations with Bobby Robson behind Revie’s back or the comic snobbery (“Revie – when I come to know you better, I will call you Don”); it was the terrible punitive hounding of Revie once he’d left for the Middle East. The worst one can say of Revie with regard to leaving England is that he sold the story to one paper – to Jeff Powell at the Mail, and he came to see it as a mistake in later years. But he had every right to leave, and every right to do the best for himself when he did so. If Sutcliffe’s account is true, then it isn’t Revie’s loyalty and patriotism that should be in question, but that of Thompson and his colleagues. The story of Revie in the Middle East isn’t often told. It’s a happy one. He and his wife enjoyed their time there, and Revie was successful in kickstarting UAE football: his youngsters would take UAE from the bottom of the Arabic pile to qualification for the 1990 World Cup. He is still warmly remembered, and his house has been kept as it was when he lived there. The rest is taken up with – taken away by – motor neurone disease. This is the right biography for Revie, now, and it opens up the field for writers who will consider him, and what he achieved, in the life of the country as a whole. Because where does football stack up? Where do football men like Revie stand in importance to England and to the UK compared with, say, William Golding, Jennie Lee, Charles Mackintosh or Benjamin Britten? That’s for later. Richard Sutcliffe has given us both a rehabilitation for Revie and an essential reference work built around him. It’s the very least that Revie the man deserved. Following on from our look at Billy Graham’s 1955 address to the BWA at Highbury, Phil Wilson (Doveson2008 of Flickr) sends word of colour FILM of Highbury in the form of a British Pathe newsreel from 1956. This weekend, Sir Alex Ferguson will surpass Sir Matt Busby’s record as the longest serving manager in Manchester United history. He’ll go on to serve his full quarter century next year, and eventually retire (or die in office) as the greatest manager of modern times. However, Sir Alex did not have the opportunity to manage at the top level during British football management’s real golden age. He didn’t take over at Aberdeen until 1978, by which time the good years, for what they were worth, were all but over. Consider this. 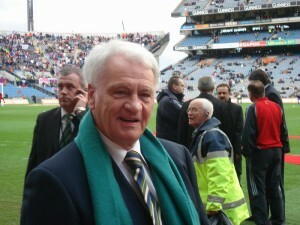 Between 1967 and 1974, the following managers and management teams were active in the English and Scottish leagues, at the clubs which they are most famous for: Jock Stein at Celtic, Bill Shankly at Liverpool, Bill Nicholson at Spurs, Don Revie at Leeds, Clough and Taylor at Derby, Ron Greenwood at West Ham, and Bobby Robson at Ipswich. There are obvious caveats – Clough’s post-Taylor years saw success and overperformance from Forest, and Robson’s management career had almost three decades yet to run when he left Ipswich for the worst job in the world. I’m not sure what I’ve said about Manchester City makes complete sense. Bertie Mee – a war hero who spent a decade at Arsenal – should receive honorable mention. So should Sir Alf Ramsey, England manager for 11 years and a manager for 25 years until leaving Panathinaikos in 1980. But other than that, isn’t it striking how similar in length are the careers of British football management’s golden age greats? Although there are variations, 14 years seems to be a benchmark figure. Why? Natural Wastage: the job of football manager is famously ageing, and it might just be that 14 years is as long as most people can take. Chapman died at the end of his, and Jock Stein – victim of a serious car crash – was felt to be not the man he had been. Footballing Followers: 14 years is also a good benchmark length for a playing career. 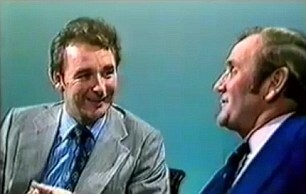 The great managers acquire followers: John McGovern went with Clough wherever the manager led him. Revie left Leeds believing that his team were becoming old and that the Elland Road club could not afford the players to rebuild. Do the followers retire after 14 years? Is the effort to replace the familiar faces all too much? Vanishing playing talent: it’s striking how many of these men chose 1974 in which to bow out. By that year, the wartime children, the greatest cohort of footballers in British history, were beginning to fade away. Derby’s first championship year was the most competitive in history, and, not coincidentally, the year in which most of that cohort were at their peak. Never again would so many clubs be realistic contenders. Did managers see a less talented future coming, as Sir Trevor Brooking does now? 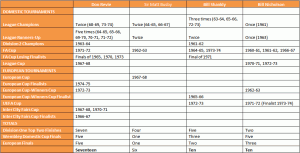 The 1973 Oil Crisis: a better point of comparison for 2008-2011 than 1929, and an event that sideswiped so much of British life that we are still only beginning to realize just how extensive the damage was. What influence could it have had on British football management? Certainly, in financial terms, clubs would never be so secure again. Pop Culture in Football: The big cultural change amongst players – think of it as the transformation from Jack Charlton into George Best – happened in the early seventies, famously bewildering Alf Ramsey. That, and the abolition of the maximum wage and retain-and-transfer, undoubtedly made team-building more difficult. Has a similar change come to pass more recently, with Bosman and the vast financial power now wielded by players? Do these cultural changes also occur every 14 years or so, making generation-straddling careers that much more difficult? Clubs used to give managers enough time: It’s true that managerial tenure used to be longer than it is now, but football clubs have always been run by trigger-happy idiots. So I don’t buy this one. Really, though, none of these explanations feel remotely satisfactory, which tells me that one of two things must be true. Either I’ve too small a sample of managers here for such generalizations to be made – or there are indeed factors that work towards creating a 14 year career length for great managers, but I’m missing them completely. What do you think? Doveson2008 kindly returned to the original slide, rescanned it and provided a great deal of additional information besides. Armed with that, Matthew and I have been able to pin down the exact time, date and occasion on which this photograph was taken. It’s c. 6.30pm on Friday, 22nd July 1955. 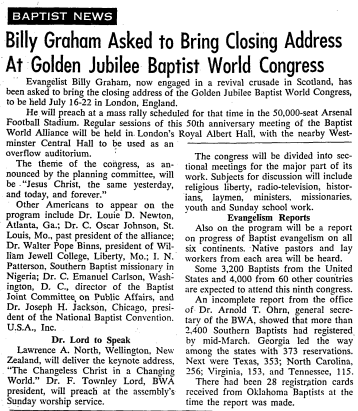 The Baptist World Alliance have been holding their golden jubilee conference at the Albert Hall since the previous Saturday, and what you see here is Billy Graham’s rally for delegates at Highbury. It was due to get underway at 7.30pm. The original slide has “BWA Rally” written on the frame, and the frame turns out itself to be of a type that was only introduced in late 1955, so my original guesstimate of 1952 was some way off. 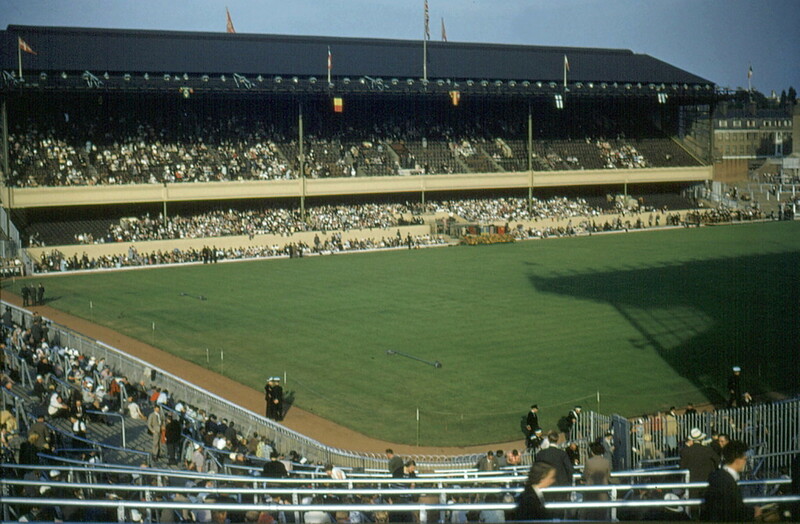 With kind permission of doveson2008 at Flickr, I’m able to bring you what must be one of the first true colour images taken of Arsenal’s stadium at Highbury. Colour photography, still or moving, came late to English football. Earlier innovations in photography, like the faster films of the 1890s that allowed “action” shots, or like early film photography itself, had found an outlet in football, which had itself been a fashionable craze at the time. Colour did not. When colour film reached early adopters in the mid-1930s, it did so in the south and it did so abroad. Colour photographers demanded colourful spectacle for their expensive footage to spend itself on. Neither football nor its home in the industrial north were high on the list, which is why the earliest colour footage of Leeds, for instance, shows the winners of a gardening competion in the suburbs. Much of the early colour football photography was done by Americans, to whom the UK was all new and interesting. 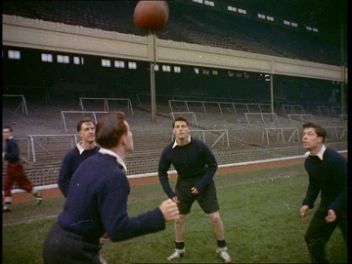 The first colour football film, which we think was made at Turf Moor in about 1943, was shot by a GI. This image of Highbury comes from a collection of images taken by American tourists. It’s difficult to say much about what took our American tourist to Highbury. It’s clearly not an out-and-out football occasion. Spectators sit on terraces when you would expect them to stand. There are no goals, no corner flags, no visible lines, and the pitch itself is in pristine close-season condition. Belgian and Finnish flags flutter: there are others too hard to identify. Everyone is smartly dressed, and a good third of them appear to be women. Something orange is taking place in the paddock at the front of the East Stand. Whatever the occasion was, they chose a perfect vantage point. Immediately to the left is the North Bank. Note how clean and fresh it looks – the new steel on the terracing rails and fencing. There’s no roof: incendiary bombs took care of that during the War, and it wouldn’t be replaced until 1956. The stand itself needed extensive rebuilding. What we have here is, in essence, a new “Edwardian-style” terrace, the last of its kind to be built at a club like Arsenal. It’s our only colour record of what such a structure would look like just out of the box. Dominating the picture, on the far side of the pitch, is one of the most famous buildings in the game, Herbert Chapman’s memorial, the art deco East Stand. Note the row of lamps on the edge of the roof: those are Arsenal’s first “official” floodlights, fitted in 1951 and brand new here. 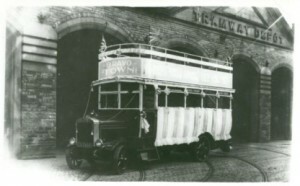 Chapman had wanted floodlighting twenty years before (it was first used for football in Sheffield and Darwen in 1878) in order to help football compete with the nascent speedway for evening audiences. The Football League, its innovatory instincts knocked out of it forever by World War One, refused. Arsenal’s first match played under the lights was against Hapoel Tel Aviv on September 19th 1951. They won 6-1: you can see the programme cover here. The season that followed would bring glorious failure. Injuries, and a fixture pile-up, saw the title lost to Manchester United in a last match decider. The FA Cup Final was lost too, more to further injuries than to Newcastle United. Arsenal finished the game with seven fit players, men who deserved more than runners-up medals for keeping the score down to 1-0. The following year, Arsenal would win the league title – on goal average from Finney’s Preston North End – and that was, truly, the last trophy of the Chapman era. Chapman’s trainer, assistant and successor, pioneer football commentator Tom Whittaker, died three years later, and his team would win nothing for another 17 years. 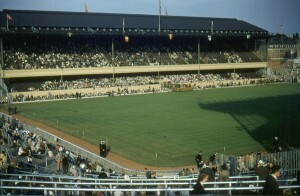 What a dignified, stately place Highbury was in 1952. Good enough for people you might think; an appropriate symbol of the spectators’ worth. As fans over 40 will remember, the calming, understated green colour schemewe see here lasted until the late 1980s. 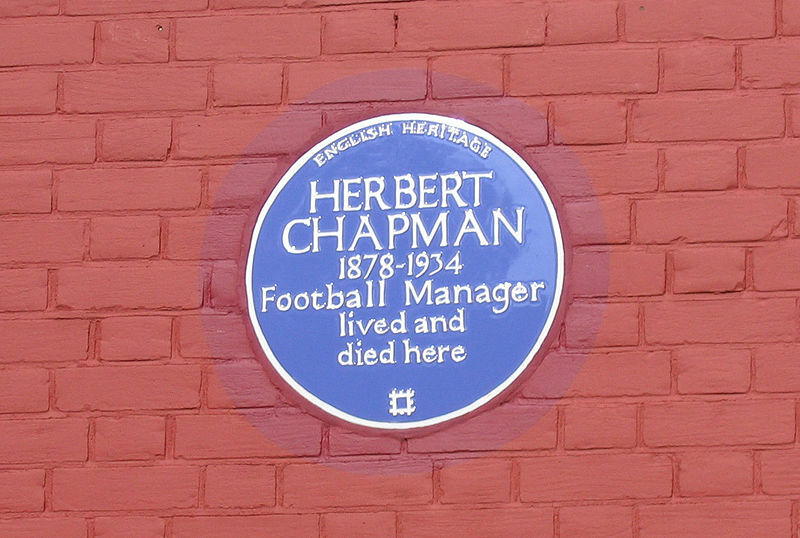 Green and cream wouldn’t suit Ashburton Grove, and whilst Ashburton Grove is a raging beauty of a stadium, turning heads on trains going north out of Kings Cross, Chapman’s Highbury was unselfish with its magnificence in a way Ashburton Grove is not. Highbury, you feel, needed people. It only came to life when the fans and spectators it was built for were present and in voice. Ashburton Grove is a magnificent but inhuman sculpture, better empty, which fans clutter up in spite of themselves like litter and weeds. In fact, the best part of Ashburton Grove isn’t to be seen from the train. From the street, the approach to the Emirates echoes the architecture of the East Stand, something that’s been skilfully done and which isn’t in the least bit mawkish or clicheed. It makes you realize just how much the East Stand is worth to North London. How easily the East Stand might have been football’s Euston Arch, carelessly smashed and removed leaving only regrets and frustrations, futility. But that’s not Arsene Wenger’s way, or David Dein’s, and they’ve embellished their own monument by ensuring the future of Herbert Chapman’s. Chapman’s, and the nine Arsenal players who died in World War II. Chapman’s, and also Buchan’s, Bastin’s, Hapgood’s, Compton’s, Male’s and the others. Chapman’s, and how many men, women and children from North London and beyond, over 90 years. They are all there early. If you imagine the FA Cup final now there would be people drifting in right up to the kick off. But the stands are full at least 10 minutes before kick off. And what an orderly crowd – it looks much more like a theatre audience than a modern football crowd would. When they go up to get the cup you can hear individuals shouting out. Now (if you could hear it over the ‘razzmatazz’ provided by the PA system…etc you would hear a dull roar from the crowd or chanting. In this video the crowd don’t feel the need to make a noise for the sake of it – they will gladly stand and watch the team collecting the cup, unless they have something specific they want to say. It gives the trophy presentation the feel of a school sports day. In 1929, the crowd are more specifically spectators, and less participants, than they are today, at least at Wembley. 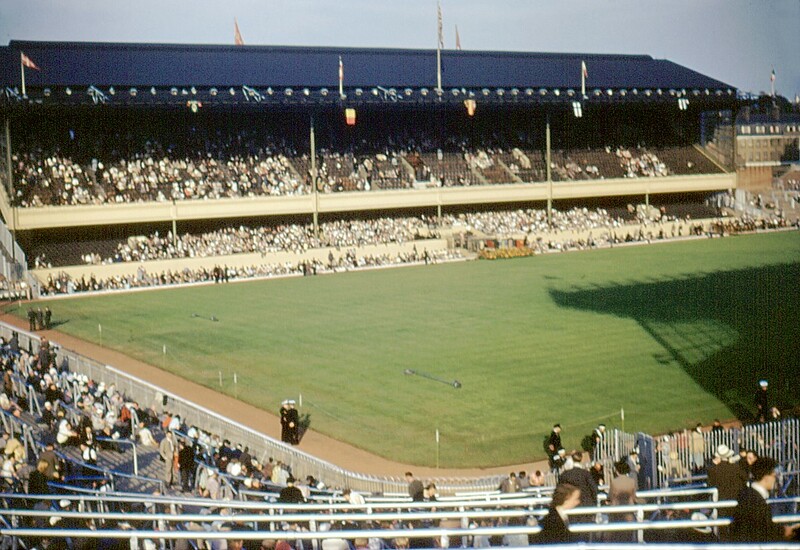 Wembley was strange turf – an away ground for everyone present, of course, and it would be interesting to have e.g. a “talking picture” from Stamford Bridge, Burnden Park or Maine Road to contrast the 1929 Final with. 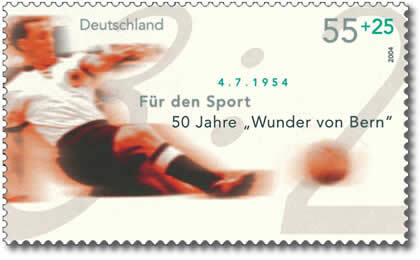 The next clip is from the closing stages of the 1954 “Miracle of Berne” World Cup Final, in which a reborn West Germany beat the Magical Magyars with a combination of tech, weather and skullduggery plus the skills and courage of an underestimated side (Morlock, Rahn & Gmb). From about six minutes in, you can watch the German reaction to the Final whistle, and then the presentation. In today’s cup tournaments, the trophy presentation has become the moment of climax. Like so much in this homophobic sport, it’s highly sexual. The trophy is handed over – it enjoys an intimate moment with the captain – and then the captain turns to the crowd, and, bang! (And streamers fall, fireworks go up, a narcissistic single by Queen jerks into action: whatever else it all is, it isn’t in anyone’s idea of good taste). In 1929 and 1954, the presentation had relatively little to do with the crowd as such. Even the chairing of the skipper – or, in West Germany’s case, the manager – looks like a comparatively private affair, something that took place amongst an inner circle, team and the team’s backroom support. FA Cup Finals have always been a case unto themselves. Yes, they decide an important competition, but it’s also the national Football Association’s big annual day out, a chance to thank the many volunteers who keep the real game going. Of the 100,000 tickets sold at the old Wembley, only a proportion would be destined for the fans of the finalists. In addition, until the 1950s, when the price of football admission and rail travel both diminished in relation to the growth in the standard of living, a journey to London would have been beyond many who attended home games. Saturday morning working would rule out others. To celebrate “with the crowd” at Wembley in 1929 might not have meant “celebrating with your core supporters” as much as it does today. So when would the supporters’ moment come? When would they be acknowledged, in public, by the team they followed? The bus would be bound for the steps of the Town Hall or City Chambers, where the trophy would be raised to a cheering crowd in a manner similar to but less sexualised that that now seen at Wembley. Inevitably, bus parades aren’t the events they once were. Chelsea’s parades, for instance, go down the Kings Road, and once ended at my former workplace Chelsea Old Town Hall. Chelsea Old Town Hall hasn’t been a Town Hall for 45 years, and has never been in the same borough as Stamford Bridge. In 1970, the Mayor of Kensington and Chelsea stood at the Town Hall window, pouring champagne into the Cup. In 2010, with an attendance similar to a minor political demonstration of the sort London sees almost every day during the summer – rather fewer than they’d taken to Wembley itself – Chelsea’s bus took them to Parson’s Green. (Chelsea’s support these days are a diaspora – coming from Sutton, Epsom, Dorking, Redhill and further afield as much as from West London – so a Wembley focus for celebration makes more sense in any case, as it would for most clubs who win the Cup these days). This last British Pathe clip shows Nat Lofthouse of Bolton Wanderers in 1958. Changes are underway in the Wembley Ritual: he gives the Cup a chaste peck, and, a minute or two later, holds it up – somewhat – chest high – for photographers. You’ll also see his speech and his holding up the Cup on the steps of Bolton Town Hall – a traditional element still in full force 52 years ago. No easing past this crowd – it’s quite clearly something those present will remember for the rest of their lives. There’s no doubt in my mind that football between the Wars was at its peak in terms of crowd behaviour and etiquette. The Edwardian game was a more violent and corrupt affair altogether. As for the 1950s, trains began to be vandalised by travelling supporters, and fan segregation surfaced as an issue outside Glasgow. It’s not the world fan nostalgia harks back to. That world, one full of loyal players with hygienic lives, Gazza skills and workman’s boots, who go everywhere by bus and never lose an international match, is a media-fuelled fantasy. And what rough fuel the media provide. 1864-8: Quintin Hogg, assisted by right-hand man Lord Kinnaird (who’d go on to be President of the Football Association and create the tradition of a royal presence at FA Cup Finals) take boys from their Ragged School near the Strand out into the country to play football (and cricket) on day trips. It’s a very early instance of the use of football as an educational, life-shaping game for everyone. Churches, factories and mines up and down the UK will adopt the idea, and many of our most famous clubs will emerge as a consequence. Hogg goes on to pioneer football as part of the curriculum in secondary education at his Regent Street Polytechnic. 1883: Northern working class football overtakes the amateur game with Blackburn Olympic’s FA Cup win over Old Etonians (for whom an ageing Lord Kinnaird stars). In truth, northern teams had probably been better for a couple of years by then. But the sheer expense of travel, coupled with disadvantages in height and weight owing to diet, served to conceal the change. 1885: Professionalism gets the go-ahead from the FA, with especial support from Lord Kinnaird and Major Marindin. Within a decade, this will have the effect of all but closing off the international game (and the top of the domestic game)to amateur players of all backgrounds. A series of financial scandals between 1890 and 1914 will confirm the fears of professionalism’s opponents, but football avoids the splits endured by rugby and the bizarre master-and-servant compromises of cricket. 1892: Goodison Park becomes the world’s first really substantial football stadium. Nothing like the Old Lady had been built since the days of the Roman Empire. It triggers a stadium-building “arms race” which culminates in Old Trafford and Stamford Bridge. No club – with the sole and partial exception of Leeds United – that failed to get its stadium up and running before 1914 will ever win a Football League Championship, and the biggest pre-1914 clubs still dominate the club game. 1901: the introduction of the Maximum Wage stabilizes the Football League financially. But players, some of whom have already become amongst the most famous entertainers in the land, will no longer be able to parlay their talent and work into a middle class standard of living. In 1927, Dixie Dean (Everton, 60 goals) meets Babe Ruth (New York Yankees, 60 home runs) and puts a brave face on the millions amassed by his US rival. 1919: with the creation of Division 3 (North) one season after the Southern League is rolled up into Division 3 (South), the Football League assumes its current size. It was then, and is now, the biggest and most stable professional football league in the world. But the impoverished, poorly-supported clubs of Division 3 (North) never match the title-and-cup-winning achievements of the Division 3 (South) entrants and remain the Football League’s Cinderella clubs to this day. 1925: Herbert Chapman and Charlie Buchan respond to the change in the offside rule by inventing the WM formation. It’s the start of modern English football management as we know it. And WM is the last real British football innovation. After this, the British game will cherrypick European and South American ideas but remain an intensely conservative thing of itself. 1928: Uruguay retain the Olympic football title. The South Americans are the first national team from outside the UK with a good prime facie case for being the world’s best. The 1924 and 1928 Olympic football competitions are bigger than any of the pre-War World Cups – and Uruguay would win the first of those in 1930 anyway. 1956: Manchester United become the first English side to enter the European Cup, following Scotland’s Hibs who’d entered the year before. The European Cup will grow to become one of the most important tournaments in the world, outstripping the World Cup itself for money and weight of talent – if not, as yet, for glamour. It’ll be another eleven seasons before first Celtic, and then Busby’s final United side, lift the trophy, reflecting just how much the footballing initiative has gone beyond Britain. British clubs will achieve much success in Europe over time, without ever producing evidence that British football has truly caught up with the modern game. 1989: the publication of the Taylor Report into the Hillsborough Disaster begins a process that will transform the country’s obselete stadia into the greatest concentration of safe, attractive modern grounds in the world. With a bit of assistance along the way from Sky Television and Paul Gascoigne, the Taylor Report will change the game’s image in England forever. 1995: the Bosman ruling finishes the job that George Eastham and Jimmy Hill started. The unfair and archaic class-ridden restraints of trade that prevented footballers from gaining market value from their talent are gone. Although there is now near-consensus that things have swung too far in players’ favour, with pay demands destabilizing famous old football clubs, there is none about how to restore the balance. Needless to say, I could have written 100 – but eleven is the key. Put yours in the comments, and also send them to @footballmuseum on Twitter. Here’s a gallery of all of the balls used at FIFA World Cups from the beginning. (H/T Metafilter). 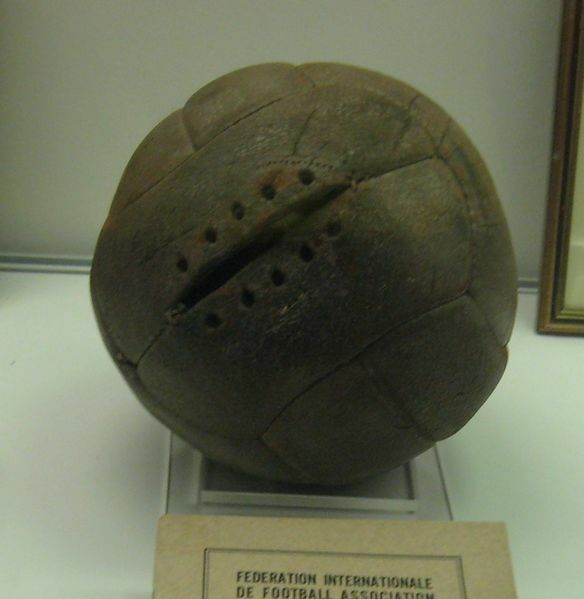 The top row of the gallery contains the kind of footballs that would have been familiar both to participants in friendlies in the 1960s and British schoolboys ninety years later. Row 2 contains what my generation might consider the Ur-ball, the Adidas Telstar, father of a million hollow plastic replicas. A couple of months of being kicked up against a brick wall would take off that clean black-and-white and leave the basic leather exposed, but the panel pattern would still show through. The most recent footballs – the aerodynamic, waterproof serious pieces of sporting kit – are the ones that look most transient, temporary and liable to break. You could say the same for today’s boots. Odd that the footballs and the football boots look least like their ancient forebears just at the time when shirts, shorts and socks have gone back – on the surface at least – to a bagginess Billy Wright might have recognised and his Hungarian opponents rejected.